Leiston itself is worthy of a day or two of exploration. This quirky corner of the Suffolk countryside and coast offers an array of facilities and attractions, from the celebrated home of steam and Suffolk’s oldest purpose built cinema, to the tranquil setting of grand boating lakes, golf course and the splendid coastline, perfect for a leisurely stroll and infamous for its smuggling community throughout the 16th and 17th century. Scroll down this page for more information about Leiston itself and other nearby places of interest. Also see the Visit Leiston website. Leiston Film Theatre is Suffolk’s oldest purpose built cinema. It is a 300 seat auditorium in an Edwardian picture house showing Dolby 3D films, plus live drama and music on occasions. To find out more about Leiston Film Theatre and to see what’s showing visit the Leiston Film Theatre website. The Long Shop Museum offers fun for families, inspiring stories and feats of engineering, gorgeous designs and the Long Shop itself – a true icon of industrial revolution Britain. You can spend a super half-day visit here. To find out more see the Leiston Long Shop Museum website. Situated about 1.5 miles from Stanley Cottage (5 minute car drive) is Leiston Abbey. Leiston Abbey was founded in 1182 by Ranulf de Glanville and is one of Suffolk’s most impressive monastic ruins with some spectacular architectural features. The Abbey was dedicated to St Mary. To find out more about Leiston Abbey see this page on the English Heritage website. 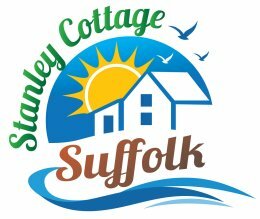 Located just 1.5 miles from Stanley Cottage is the nearest beach located at Sizewell, which is something of an undiscovered retreat. There is ample and cheap car parking right next to the beach. It is an award winning beach of shingle and sand dunes, quite unusual on this stretch of coastline. The beach makes the ideal location for a leisurely stroll, where dogs, with responsible owners, are very welcome. On a fine day, a walk along the cliffs provides some picturesque views with access to the Beach View Holiday Park, where non-residents are welcome to enjoy some light refreshments on the balcony, whilst admiring the coastal views. To find out more about Sizewell and Sizewell Beach see this page on the Visit Leiston website. This diverse site is one of the best wetlands in East Anglia for wildflowers. It is a stronghold for otter, water vole and kingfisher, whilst water rail and barn owl can often be seen. The wildflower meadows, which are maintained by cattle and sheep grazing, include four species of orchid, yellow rattle, ragged-robin, bogbean and lady’s smock. To find out more see the Sizewell Belts Nature Reserve page on the Suffolk Wildlife Trust website. To find out more see the Minsmere Nature Reserve website.